The cover of #2, and hints in solicitations, suggested that this storyline would split the team apart. The next 2 issues will be part of War Of The Realms, so if there's to be a part 5 of this story then it will presumably have to wait until then. But there's no sign yet of such a large split. #5's cover has Ms Marvel and Viv Vision. #6's cover has Snowguard and 3 of the new recruits. The named chars *are* on opposite sides of the split on #2's cover. But this may be coincidental, especially as cover chars aren't necessarily all in the book (#2 is a case in point). So far only Spider-Man and Sam Alexander have actually left the team, and Sam wasn't even on the split cover. Ironheart and Wasp haven't been seen here since #1, but they're still on the page 1 character list. And that pair are on opposite sides of the split. Riri Williams statements in the Ironheart series suggest that she has problems with the team. But she's on Ms Marvel's side of the picture - a Remainer as we in Brexit-cursed Britain would say. So who knows what's happening! Perhaps more can be made of the fact that Dust has been *added* to the char list (while the new recruits haven't). Mephisto's son Blackheart was introduced in Daredevil #270 & #278-281. 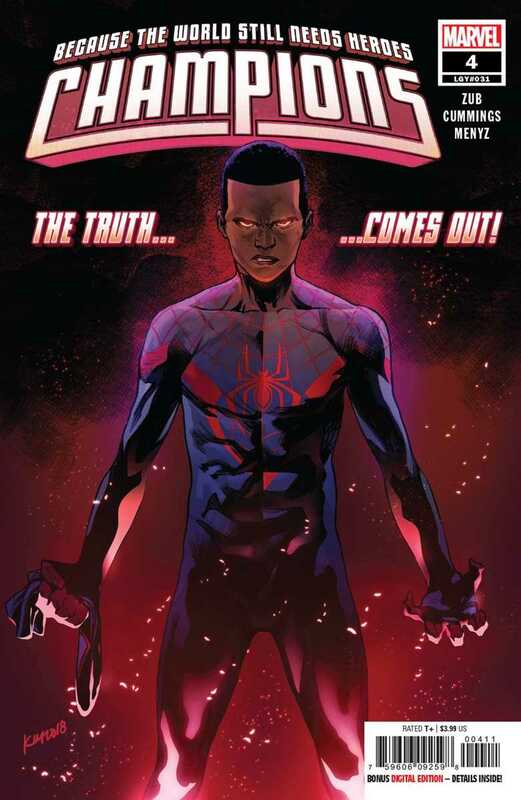 He clashed with the Miles Morales Spider-Man in #1-2 of his 1st non-Ultimate Universe series. After that Blackheart tried to take over Chicago in 2017's Falcon #1-5 (that's the Sam Wilson Falcon not the Joaquin Torres version here). That ended with him being taken to his father for punishment. Ms. Marvel has followed Spider-Man to Dubai, the site of their mission in #1. She wants to know why he's been acting strange since then. Miles Morales doesn't want to tell her. Viv Vision has led some other Champions (Brawn, Snowguard and new recruit Falcon) to deal with an anti-mutant riot in Manhattan. Sam Alexander was piloting the hovering Champions Mobile Bunker which seems to have been hit by something. This seems to have dispelled the rioters, and only the lone mutant Dust is left with the Champs. ... but Snowguard swoops up to save him. The other winged Champion Falcon carries Brawn up into battle and synthezoid Viv floats up beside them. Kaldera leaps out to meet them and hacks at Falcon's wings. And Brawn joins the alien in freefall. Viv phases into the CMB to join Sparky and tries to work the craft from *inside* it's control panel. Kaldera, Brawn and even wing-damaged Falcon hit the ground hard. Dust sees only Kaldera get up. 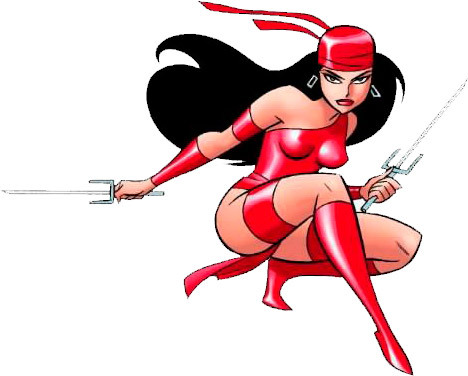 The assassin thrusts a blade through the mutant, but Dust had obviously changed her body to sand inside her abaya and niqab. And now she unleashes a sandstorm against her assailant as Snowguard and Sam land behind her. Meanwhile Viv brings the CMB down to a 'safe' crashlanding and phases out with the dog to join the others. Kaldera demands that Nova fight her so she can regain her dignity. Sam agrees to let her beat him up but it'll be a 1-sided fight because he's no longer Nova. The Nova Corps confiscated his Nova Helmet (Infinity Countdown: Champions #2). So now she says she'll go with him to regain his helmet, and *then* she can kill him. His teammates think it's a bad idea but Sam says he'll accompany her. He wants to get her away from Earth before she does more damage, and if he gets his Nova Helmet back it'll be a bonus. Kaldera calls her spacecraft down and they depart. At that point Pinpoint portals in after taking Ms Marvel to Dubai, asking what he missed. Back in Dubai Miles reminds Ms Marvel of how his friend was killed (#24 of the previous series) and she persuaded him to hope rather than despair. He now tells her that in the battle here against Zzzax 8 days ago she and Viv died. Which of course comes as a shock to Kamala Khan. But then he chose hope and made a deal with Mephisto to wind back time so he could save his friends. He assures her that the devil hadn't wanted anything in return like his soul. But a side-efect was that the 2nd time around he didn't save the life of a local girl Faridah, and he doesn't know how to cope with that. Kamala is devastated. But blames herself as team leader and says she'll quit. Spidey responds that the Champions *need* her, and it is *he* who must quit. And he webslings off. Watching all this from Hell is Mephisto, with his son Blackheart in chains behind him who can't understand why his father did this without extracting a price. The demon says he's playing the long game. He wants to corrupt the purity of the heroes' souls now while they are young and vulnerable so they won't grow into more troublesome do-gooders later. Neither of the pair can bear the truth of what happened, and it will eat away at them. And he's going to send Blackheart to ramp up the torment. Plus: Blackheart, Brawn (Amadeus Cho), Champions, Dust (Sooriya Qadir), Falcon (Joaquin Torres), Kaldera, Mephisto, Pinpoint, Sam Alexander, Snowguard (Amka Aliyak).